Dogs are incredibly intuitive and, whether you believe it or not, they have a sixth sense when it comes to understanding human emotional needs. It is their sixth sense that helps them become such good friends of their human owners. A dog as a friend is often better than friends or family, as without you even saying a word they can sense your excitement and happiness as well as sadness and stress. In fact, they also respond according to your emotions and seem to genuinely care about your feelings. Because of this, they are also recommended as part of therapies for treating human emotional problems. In addition, dogs seem to be able to help identify medical issues in their owners. This has been reported in news stories as well as recent studies. Some therapy dogs also are trained to assist their owners who have chronic health issues. 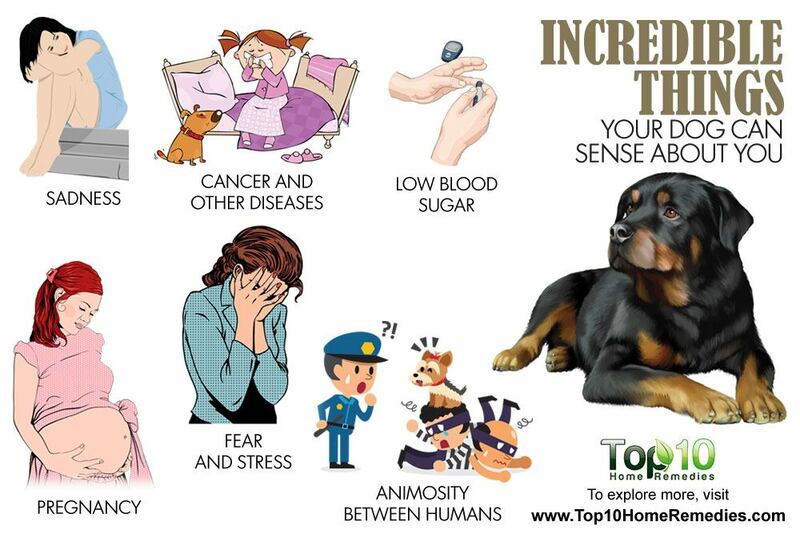 Here are the 10 incredible things your dog can sense about you. When you feel sad, your four-legged friend can immediately sense it. A new 2016 study published in the Royal Society’s journal Biology Letters reports that dogs can recognize emotions in humans by combining information from different visual and auditory cues. 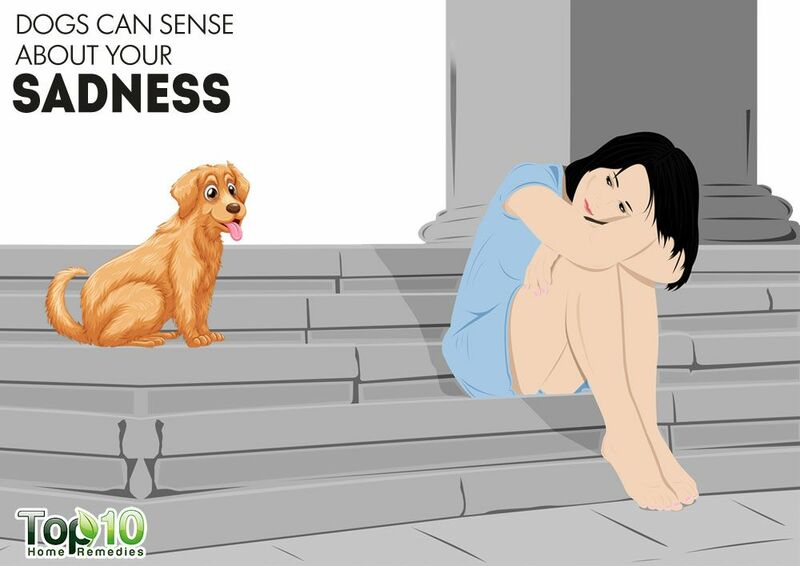 Your dog can feel that you’re sad even if you try to behave normally around your pet or other family members. Sensing your sadness, your pet may become more subdued than usual. He may even lose interest in his toys and refuse to eat. It has also been found that when the master is sad, a dog has the tendency to watch him quietly from a corner of the room. The dog may also come over and lie down at the feet or gently rest his head in his master’s lap. In the case of crying, the dog may also lick away the tears. A 2012 study published in Animal Cognition found that a dog was more likely to approach someone who was crying than someone who was humming or talking. Also, dogs respond to weeping with submissive behavior. Dogs have the ability to sense diseases, too. With about 220 million scent receptors, dogs can smell things that seem unfathomable to us. Dogs are famous for detecting cancer. They can sniff out a variety of cancer types, including skin, breast and bladder cancer. A 2006 study published in Integrative Cancer Therapies found that trained dogs were able to detect breast cancer with 88 percent accuracy, and lung cancer with 99 percent accuracy with the help of breath samples. A 2010 study published in Cancer Biomarkers found that the sensitivity and specificity of trained sniffer dogs allow them to detect volatile organic compounds (VOCs) as biomarkers of bladder cancer. In a 2014 report from the American Urological Association, researchers at several leading Italian institutions investigated the level of accuracy at which a highly trained dog can recognize prostate-cancer-specific VOCs in urine samples. It was found that dogs were able to detect VOCs in the urine of study subjects with 98 percent accuracy. Apart from cancer, dogs can also sense narcolepsy, a kind of brain disorder that affects the ability to control sleep-wake cycles. A 2013 study published in Semergen found that two trained dogs were able to detect 11 of 12 narcolepsy patients using sweat samples. This study demonstrates that dogs can detect a distinct scent for the disorder. There is also growing evidence that dogs can and do detect the onset of a seizure or a migraine attack. Your furry friend can even sense pregnancy. Women owners surely notice changes in their pet’s behavior during their pregnancy. Some women report that their pet became more protective, attentive and loving all of a sudden. Some dogs even start escorting their pregnant owners everywhere they go. From time to time, they may also nuzzle and sniff the expectant mother’s round belly and rest their heads on it. 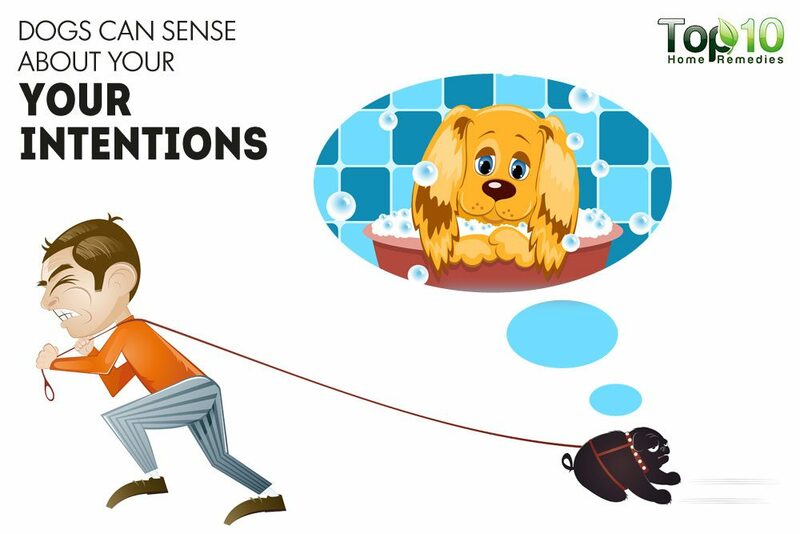 These sudden changes in a dog’s behavior are mainly due to physical changes that the dog can sense within their owner. 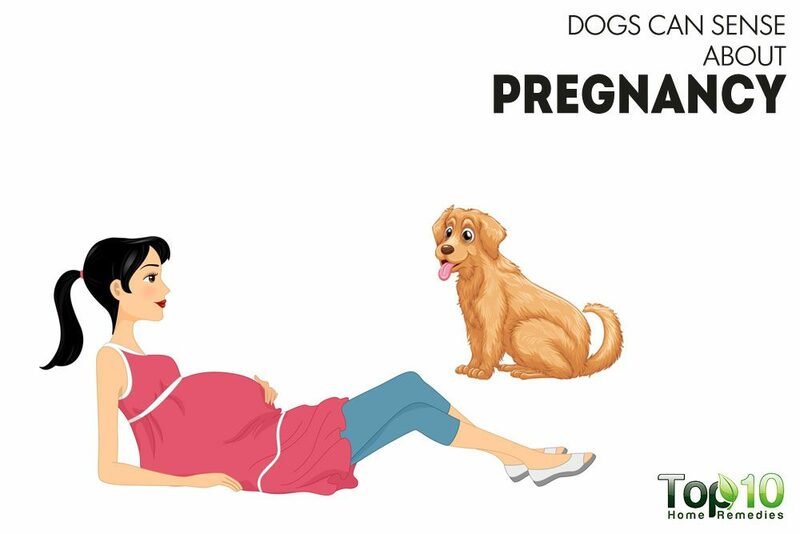 Dogs also react to environmental changes that occur at home as a result of pregnancy. Reaction to pregnancy in some dogs may make them more fearful. During pregnancy, do not ignore your pet and spend some time each day taking them to the nursey. Establishing a gentle, loving routine with them will help your pet adapt positively to the upcoming changes in the home. In addition, having a dog during pregnancy is beneficial for the woman. A 2012 study published in PLOS ONE found that pregnant women who had dogs were more active through walking than those who did not own dogs. It is believed that dogs can even sense upcoming earthquakes before they actually happen. This has nothing to do with anything supernatural. It is their strong hearing power that helps them sense the upcoming natural disaster. 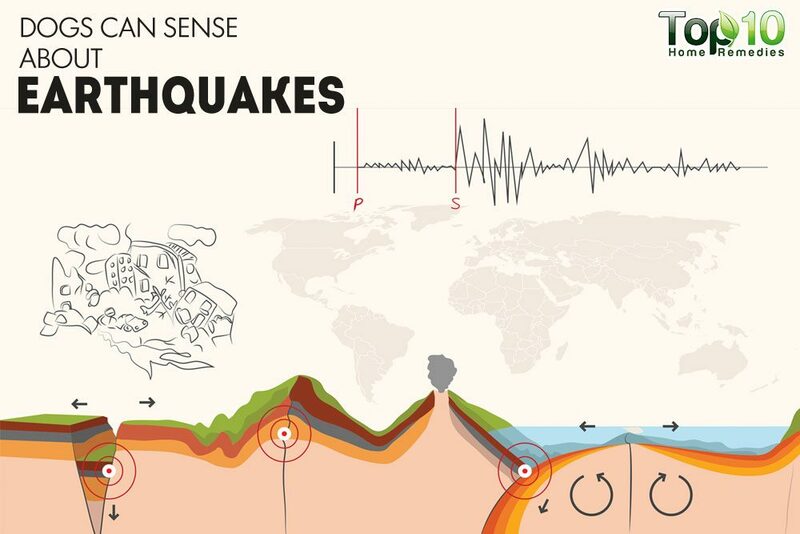 Dogs can hear the movement of rocks underground in the earth that happens just before earthquakes. Dogs can start howling a lot before an earthquake. Some dogs even start pacing or prefer staying close to their people. If you live in an earthquake-prone area and your dog begins to act odd, do not ignore this sudden change in behavior. Be alert for the upcoming natural disaster. 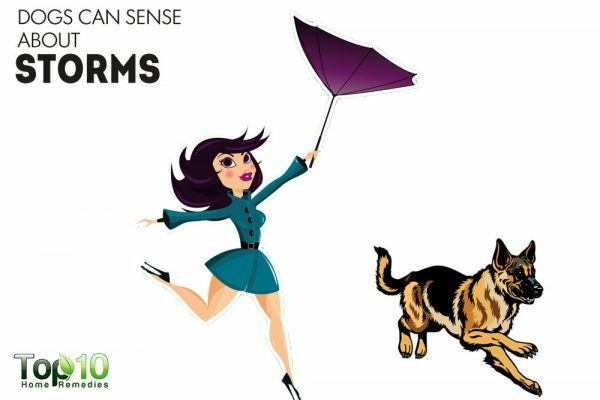 Long before a severe storm approaches your area, your four-legged companion can sense it. Your pet may start pacing, panting and acting in an agitated way even though the outside environment looks just fine. A dog can sense the sudden drop in barometric pressure and the shift in the static electrical field that occurs prior to climate changes. Their olfactory senses are about 100 times more sensitive than that of a human and they most likely can smell the electrical current in the air. Also, their strong smelling sense can detect concentrations of chemicals in the air that humans cannot even feel. In addition, a dog’s hearing power is more sensitive than humans. They can hear rumbles that you might not even hear until they are occurring within your area. Humans give off faint odors when suffering from diabetes. 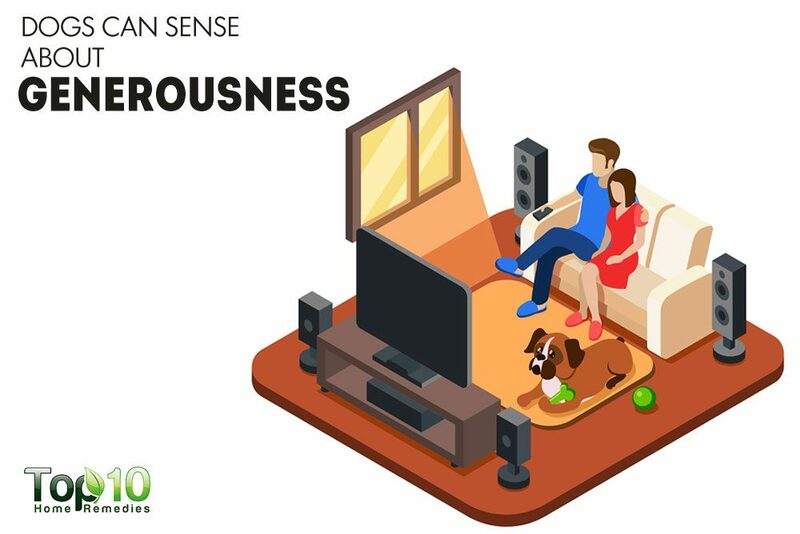 The odor is too subtle for humans to detect, but your furry friend has an amazing sense of smell and can detect the problem and its associated complications. In fact, there are true incidents where dogs have saved lives by alerting people to a low blood sugar level even before the person feels any symptoms or takes a blood test. Low blood sugar changes the volatile organic compounds, which a dog can smell. 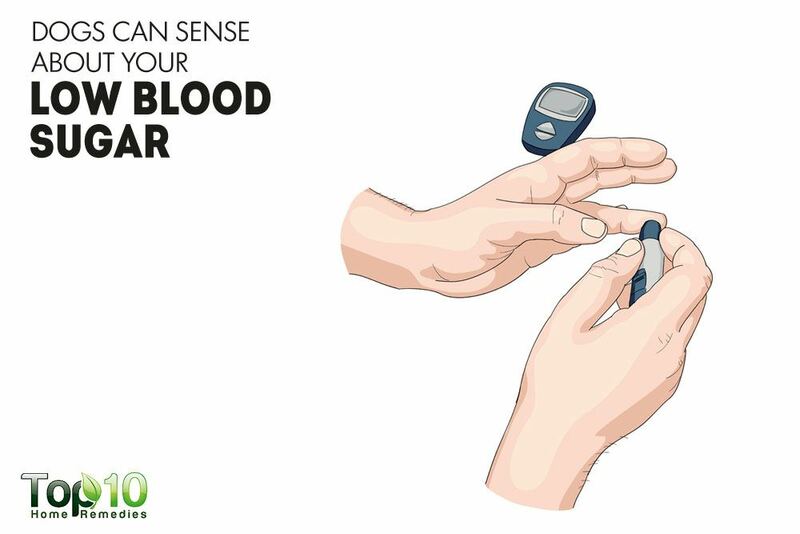 This usually happens in people taking diabetes medications. A 2016 study published in Diabetes Care found that the dogs detect isoprene, a common natural chemical found in human breath that increases during episodes of low blood sugar. The dogs can signal their owners about the problem by whining or licking their hands. Many service dogs are trained specifically to help people who are insulin-dependent. A 2013 study published in PLOS ONE reports that having a diabetic alert dog seems to provide significant improvements in both the safety and quality of life of insulin-dependent diabetics. Your dog can sense when you do not like other people. 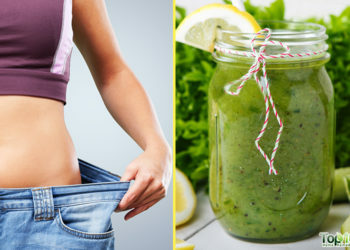 Several chemicals are released in the body in response to thoughts of dislike, irritation, hatred, etc. and dogs can sense these chemicals. Also, dogs pick up clues of your dislike from your body language, gestures and the way you are communicating with the other person. In fact, looking at you, your pet may even show signs of dislike for the other person. 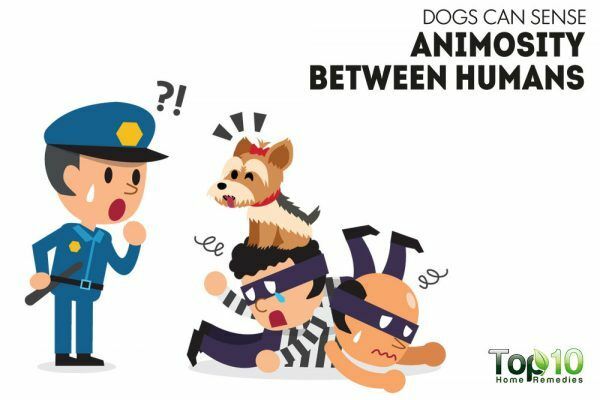 Your dog may start barking, growling or even lunge at that person if he or she tries to approach you. Dogs have a tendency to feel extra protective over their masters if they perceive other people as a threat. Dogs can sense the generousness in a person. Just like humans have a tendency to judge a person on the basis of their actions, dogs also pay attention to how you act toward others. In a 2012 study by the University of Milan, researchers allowed dogs to observe humans in social situations. The dogs watched one set of actors sharing their food with a homeless man, while the group of dogs watched other actors behaving in an aggressive manner. Afterward, the two sets of actors were asked to call the dogs at the same time. It was found that dogs responded positively to the generous actors when called and avoided the aggressive group. Dogs are social animals and they expect reciprocity, kindness and fairness from their masters. A dog can feel it immediately when their owner is afraid or stressed, even if they aren’t showing outward signs. Dogs can smell the surge of hormones the body releases in response to stressful situations, including adrenalin and cortisol. Hence, your dog knows about your mental state in an instant. You furry friend may start showing signs of protectiveness toward you and most likely will spring into action and come to your rescue. 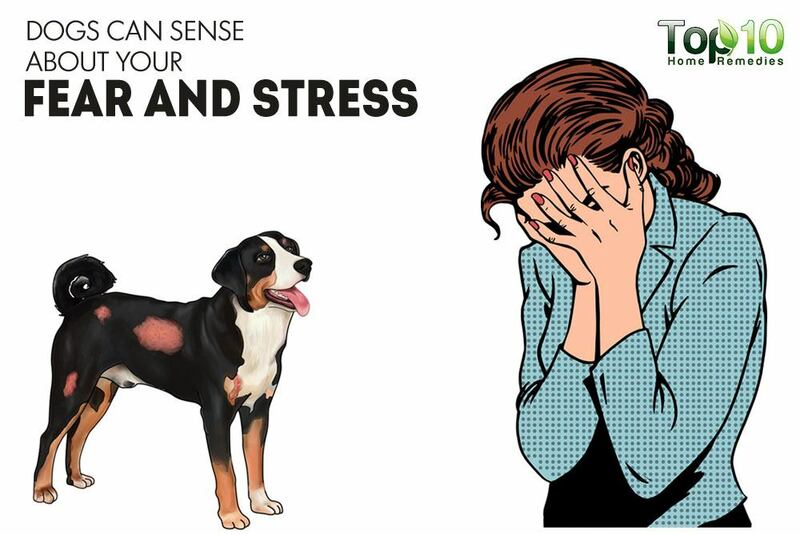 Dogs may also try to comfort their owners, which can help prevent panic attacks and other possible episodes associated with post-traumatic stress disorder or other issues. Dogs follow your gaze to get a read on what you are thinking, thus they can sense your intentions correctly most of the time. For instance, dogs may start looking for a place to hide before their bath time. This can happen even before you turn on the water or touch his towel. The same goes for haircuts and nail trims. 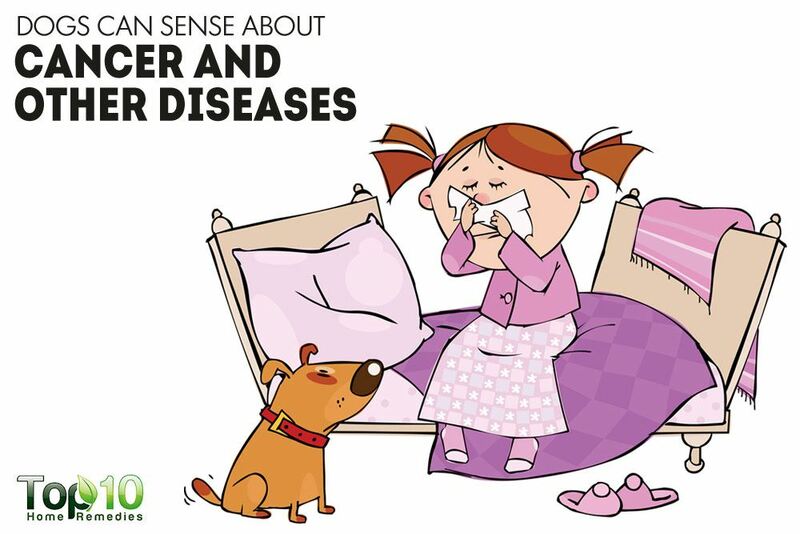 Similarly, dogs can sense that you are taking them to a vet. Dogs may stare worriedly out of the window of the car, pace back and forth or eye you suspiciously. Some dogs also develop a set of antilock brakes near a vet clinic that makes them nearly impossible to move. Offering some reassuring words and gentle encouragement can help your dog submit to these unpleasant experiences. Right now my 3 year old maltese is lying down across the room looking sad. HE must know I’m sad. I pretend to be really happy but he’s sensing I’m not. IT’S dark now. IF it weren’t we’d be walking very far. ?